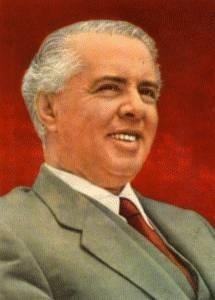 (1) Comrades of the leadership of the Party and State, also, attended this meeting with workers from the hydro-power plant of Koman, the «Enver Hoxha» automobile and tractor combine, mines, oil-fields, and textile mills, working people of agriculture and young volunteers from railway construction sites. Take your seats, everybody, please. I know some of you, those who are more advanced in age, with greater experience and longer seniority at work, but most of you I don't know, because you are young. However, it is a great pleasure for our Party and for us to see that the younger generation of our country has risen so high and has made the country like a flower garden. You are the flowers of Albania. Yes, we receive good news continuously from all sectors of the economy, which delight and enthuse us, and which make us feel younger. From the work of the Party and from your work we gain confidence, but we gain knowledge, too, because, comrades, it is clear that this wonderful reality we have created in our country is the work of the people, is your work, is the result of the correct line and the well-studied plans of the Party. Therefore, this is a source of joy not only for us, but also for the whole people and for all the friends of our country, wherever they are, while it enrages our enemies. The enemies are blinded with rage by our successes. I have followed you up in all your magnificent work, but when I see you on television from time to time, and it is a good thing that special programs are often devoted to your work, which is an encouragement for all our people and increases their confidence in their mental and physical forces, I feel special respect for the workers, for the engineers, for the technicians who are building such projects as the hydro-power plant of Koman, that giant of iron and concrete, one of the biggest in Europe. I have been told that the foreigners who have come to see your work have been amazed by everything, your order, your discipline, your intelligence and your skill . In all the sectors of our economy now there is a new approach of our worker to his work, a different, more thoroughgoing kind of thinking, because even the common worker in our country has a high political, ideological and technical level. Even the worker who does the most simple work at the hydro power plant is politically mature, is qualified for his work and thinks and works for the dam, thinks and works for the electric power, for the development of the whole economy of our country. The Party has always placed the production of electric power in the centre of its attention, seeing it as one of the major issues, because without electric power no progress can be made. Before Liberation our people lived in wretched misery, used pine torches for light, but now that we are building socialism, that our country is developing with big strides, nothing can be done without electric power. There are demands for our electric power not only from the neighbouring countries, but also from other states of the world which are affected by the energy crisis. We have attached importance to the production of electric power and will continue to do so in the future. That is why even those who don't wish us well are compelled to recognize our achievements in this field. So, those teams of yours, from designers to simple builders, must be clear about it that we will not remain where we are in this work. More hydro-power plants and thermal-power plants have been designed, and we will design more, much bigger than those we have built, in the future. That day at the Plenum, (2) when I asked your director to convey my regards to you, which he has certainly done. I was moved. Today I am moved again, but I am also glad to meet you. I have noticed that emotions prolong my life. Thank you for the honour you have done me by coming here, to my home, to report to me about your work and great achievements and, at the same time, to congratulate me on my birthday. On my behalf and on behalf of the Party, I thank you and congratulate you on all the successes you have achieved. For my part, I assure you, the Party and the people that, as long as I live, I will spare nothing for and will place everything in the service of our great cause, the freedom of the Homeland and socialism. It is the work of the whole people, the correct orientations and the far-sighted plans of the Party that have created our brilliant, enthusing reality, this uninterrupted improvement in well-being, this non-stop advance of socialist Albania. We have achieved good results in agriculture, especially this year. Foreigners visiting our country are surprised to see our terraced hills and mountains. At Dajç, as the comrades have informed me, the cooperativists have succeeded in taking in, in individual plots, high yields of maize, reaching to over 120 quintals per hectare. Very well and well done! Agriculture in our country has made enormous strides and we are very happy about this. You, the elder people, know what the situation was like before Liberation, because you were born on that sun-scorched and desolate land, but under the leadership of the Party and with the magnificent work of your parents and your own work, agriculture today has become a powerful economic factor for the People's Socialist Republic of Albania. See what fruit have yielded the directives of Lenin and Stalin for the collectivization of agriculture creatively applied by our Party in our country. The greatest achievement was that the peasantry succeeded in understanding that putting together their lands was a vital necessity. In this direction we have had difficulties, but the Party has had great faith in the people. It has continuously taken account of Lenin's teaching that the people will understand what they want through patient and persistent work, so the Party proceeded patiently, and now our peasant has reached such a level that he cannot understand his life without the cooperative, that is, he places the general interest above the personal interest. Our Party carried out a series of Marxist-Leninist reforms for the development of agriculture. Many of them do not appear in the works of Marx or Lenin, but both Marx and Lenin have given us the principles, they have taught us that socialism should also be built on the basis of experience. We implemented the principles in a correct manner and solved other problems which emerged on our road, too. So, the Party knew how to build a socialist agriculture, to ward off the possibility for the emergence of capitalism or the development of a spontaneous economy, and did it with skill , with ability, by means of its policy and ideology, by applying agrotechnical measures, etc. Every sector of our life and activity, the industry and the mines, the power industry and the cooperativist agriculture, education and culture, develop every year and every five-year plan at satisfactory high rates. You comrade builders of hydro-power plants and all the other major projects have designed, have built and will build in the future still greater hydro- and thermalpower plants. You comrade oil-workers not only have given the Homeland a great wealth, but, also, by implementing the directives of the Central Committee of the Party, opened up new promising horizons for oil extraction. (3) In 1983 a number of agricultural economies took in 70 quintals of wheat per hectare or more. Before the liberation of the country, the average yields were 7-8 quintals per hectare. A good maize harvest is expected, too. All these successes have been achieved with the work and the efforts of our working people, and our technical cadres of higher or medium training, who now number tens of thousands and who have been trained and educated in our people's educational system and have a contemporary progressive culture of a high level. It is natural that our people should be delighted with these successes, but these should not make us think that we have achieved everything and let ourselves be carried away with euphoria. On the contrary, everything should be consolidated, achievements should be maintained and carried constantly ahead. Every success has its source in work, in discipline at work, in the active creative and realizing work of the masses. You know quite well that on our road of socialist construction we have come up against difficulties and obstacles, which we have avoided or overcome through struggle and efforts. In the future, too, which will be much better than the present, we shall have to cope with many difficulties and shortcomings, objective or subjective, but we shall overcome them with success, as we have done. Hitherto. We all have unshakeable confidence in our glorious Party, in its Marxist-Leninist line, in its correct, resolute and far-sighted internal and external policy. In this line and in this policy lies the strength of our people who have worked and continue to work wonders. Can we say with full conviction that Albania has made enormous strides? Yes, we can. When we come to think of what we have been and what we have become, then we can see the great work that our Party has done, and the great ideas it has worked out. Its ideas, based on the Marxist-Leninist theory, have enlivened people, educated them, made them courageous and bold in their thoughts and actions, that is why we have achieved all those things we have and enjoy today. We say, and we can prove it, that we are the only country in the world which is building socialism. There are no other socialist countries. We apply Marxism-Leninism in our concrete conditions. The policy of our Party in all its directions is based on the Marxist-Leninist theory and has as its aim the building of socialism and the protection of the interests of our Homeland, its independence, sovereignty and freedom. We have built everything ourselves, with the sweat of our brow, and with the toil and knowledge of our sons and daughters. Our magnificent reality could not have been created by some so-called socialist states, which, under the cover of aid, rather than help us, robbed us. Besides, we have paid them back to the last cent even for that aid which they claim to have given us. Those who sell us their turbines, engines or other machinery, which we have paid either in ready money, or with our primary materials, cannot pretend that they have built our magnificent hydro-power plants, our railways, our combines, or developed the agriculture of our country, which has been transformed into a flowering garden. Our hydro-power plants, railways, combines and plants, our systematized fields and wonderful terraces of citrus and other fruit-trees are not the work of one or ten foreign engineers, agronomists or geologists, who have come to our country for a term of time under the disguise of «friends». They could not do anything without the strength, without the will power, without the knowledge and the tireless work of our wonderful people. But instead of helping us, they sabotaged us badly, impeded us whenever they could, and when we got rid of them, everything came back to the right road, the country assumed a new aspect, development and progress proceeded at great strides and we ourselves built many more projects than were built before. With the departure of the foreign specialists, the enemies thought that we would capitulate, that we would surrender. But they were greatly mistaken and deceived. They never knew the strength and vitality of our people and our Party. We would have lagged very much behind had we not shaken off all the pseudo-friends, from the Yugoslav Titoites and the Khrushchevites to the Chinese and others. They have sabotaged us, have restrained our development, therefore, it is they who owe a debt to us, and not only a political debt, but also an economic debt. Every discovery and progress in our country has been made through the ability of our Party and our people. Let us take up the problem of the oil, in which the foreigners claim to have «helped us». Actually they kept the data about our oil resources secret from us, just as they did with our mines. What the foreign specialists did in this field was equal to their abilities, and their abilities were limited because they had other aims up their sleeve, they had come to do something else and not to help us. Now that we have greater experience, that our miners and engineers have more knowledge, we are able to judge very readily what capacities those people had and what capacities we have. Hence, comrades, they did not come here in order to help Albania, but on the contrary, to enslave it, so that we would depend on them. All the mines we have today, the iron-nickel, copper and other mines, have been built by our courageous and valiant miners, under the leadership of the Party. In the past we used to say that nature had given wealth to the other countries, whereas it had given only mountains to our country. Now these mountains are a great and very valuable asset for us, not only because they conceal treasures in their depths, but also because they serve as fastnesses to defend our beloved Albania, which we have built and have made so beautiful and will make still more beautiful in the future. We all remember that decades ago the world saw socialist Albania as a small satellite of the Yugoslavs, then of the Soviets, and later of the Chinese. However, with the passage of time those who saw and considered us as such were convinced that Albania had never been a satellite. Those who thought and judged like this were disillusioned. The others, who wished our country well and were realists, found this reality natural, therefore they defended and still defend us today. Whereas the various enemies, who failed in their anti-Albanian, conspiratorial ambitions, were compelled to change tune. This time the defence of the freedom, independence and sovereignty by the Party of Labour of Albania and the Albanian people was called «isolation from the outside world»! But what did the enemies understand with isolation? Just the fact that we did not sell ourselves to the foreigners, to world capital, did not allow our country's life to degenerate, did not incur debts to the superpowers and the other imperialist powers, did not sell our socialist Homeland, did not march in step with them, did not go towards spiritual, economic and military enslavement, as the gentlemen who malign and criticise us did and continue to do in order to cover up their obvious bankruptcy. In order to cover up the tragedy which is going on at the expense of the peoples, American imperialism and its secret agency, Yugoslav Titoism, coined the political term «non-aligned countries». When the question is asked what makes these countries non-aligned, the answer is that they are formally outside NATO and the Warsaw Treaty. However, the political, ideological, economic and military commitment of most of the non-aligned countries to the superpowers and the developed capitalist countries is an undeniable fact. This commitment has become a second nature for many leaders of these countries, who employ their so-called policy of non-alignment as a fig leaf to cover up their complete dependence on the big powers. In most of these countries, the profits accruing from enslaving loans and credits to the banks of the big capitalist states end up in the pockets of the local rich and the foreign capitalists and monopolists, while misery, crisis, degeneration weigh heavy, as always, on the backs of the peoples, the working masses. Socialist Albania has avoided this grip, that is why the champions of imperialist plunder consider it «isolated» from the world. But we Albanians don't care at all about this «label» they stick to us. On the contrary, we are marching on the correct course under the leadership of our Party, the course of socialist construction, constant progress and improvement of the well-being of the workers and increase of the prosperity of the Homeland, a course which knows no crises or debts. The progressive world, that world which judges with its own head, the peoples who are working and fighting for freedom and the sovereignty of their lands, make a correct assessment of our course. Our reality is the majestic work of the Party of Labour of Albania, it is the result of the faithful implementation of Marxism-Leninism. This is why the enemies oppose our Party and Marxism-Leninism. They do so because our reality makes more evident the betrayal of Marxism-Leninism by all the modern revisionists and shows the vitality of our theory. Small but invincible socialist Albania, free from the revisionist scum which has spread throughout the world, shows the whole mankind that when the peoples rely on the Marxist-Leninist theory and their own forces, socialism is built successfully. The Yugoslav Titoites are sworn enemies of socialist Albania. For 40 years on end they have striven with all manner of means to impede our advance. We won because right was on our side, because we were confident in the line of the Party, and relied on Marxism-Leninism. Yugoslavia is up to the neck in debts, although recently we are hearing the Titoites using the phrase «we are building socialism with our own forces». But the world is not blind and can clearly see that Yugoslavia is building capitalism with foreign forces. They do not say this, but we say this to them every day. This has made them to launch even more vicious attacks on us. Those who are financing Yugoslavia and propping it up say so openly in their press, indeed they have admitted to us verbally, that they are giving Yugoslavia «oxygen» to breathe, otherwise, it would die. The capitalist states are competing as to who will grant more credits to this insatiable monster. This competition enriches foreign and domestic capital, while the people languish in misery and poverty. There prices are constantly rising and inflation is soaring. Likewise, unemployment and national oppression have increased. Titoite Yugoslavia has been transformed into a chessboard for the game between two opponents, the United States of America and the Soviet Union. The outcome of this game is «check-mate» for Yugoslavia, but also a threat to peace and security in the Balkans, Europe and the world. The world today, comrades, is going through a turbulent situation, the threat of war is great. Everybody admits this publicly. But what is done to prevent this? There is much talk, indeed regional and international meetings are held about it. But what comes out of them? Nothing. On the contrary, the danger of a nuclear war is increasing and the capitalist-revisionist world is feverishly arming. Who is inciting this histeria of a new war? On the one hand, NATO, led by the United States of America, and on the other hand, the Warsaw Treaty, led by the Soviet Union. What are the so-called non-aligned countries doing in these circumstances? Some of them, egged on by the superpowers, are fighting amongst themselves in Africa , the Middle East, Asia, Central America, and elsewhere. In these countries peoples are shedding their blood for the interests of the superpowers, which are dividing and redividing the spheres of influence, inspiring and carrying out plots against the peoples, inciting the slaves of the dollar or the ruble to encroach on the borders of one another. Currently, the leaders of Titoite Yugoslavia are trotting about in all directions trying to envenom the situation, screaming that «the threat to Yugoslavia, the Balkans, and Europe comes from socialist Albania,» «from the dictatorship of Enver Hoxha,» «from Albania's non-participation in the Helsinki Conference, the Madrid Conference,» or any other such meetings which have yielded and are yielding no result, on the contrary, now we see that nuclear missiles are to be stationed in Europe and the menace of the outbreak of a world war is imminent. Can a world war which threatens to break out be avoided if the policy of the Soviet Union, the United States of America, NATO, the Warsaw Treaty, the European Common Market and Comecon is not opposed and exposed? Can a world war be avoided by getting into debt to the one and the other, by smiling now at the one now at the other, by resorting to blackmail against and making concessions to the one or the other? No, in no way! On the contrary, this leads to catastrophe. Our defence of the rights of our Albanian brothers in Yugoslavia does not mean, as the Titoites claim, that we wish Yugoslavia ill . No. We have proclaimed our stands clearly and publicly. We have never interfered in the internal affairs of Yugoslavia. It is the Yugoslav Titoites who have plotted and continue to plot against the freedom and independence of the Albanian people and socialist Albania. 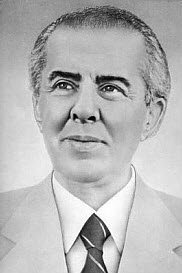 We are aware of and always bear in mind the aims of all those why organize secret plots of a fascist-clerical and annexionist character to destroy our regime and partition Albania. However, it must be clear to all that they will never succeed in their sinister aims. The Albanian people will smash all plots and hostile activities, just as they did with the hated criminal band of the multiple agent Mehmet Shehu. We constantly weed our garden, other weeds may crop up, but we have «herbicides» to fight them. As we told you, when we informed you of the decisions of the Central Committee on the treacherous activities of the agents Mehmet Shehu and Kadri Hazbiu and company, we acquainted you with the strategy of our Party, which is rock-firm, as the comrade from Koman said here. Our tactics are based on Marxism-Leninism and weigh up all situations and all circumstances. We know that here we must advance that far, there that far. Socialist Albania desires to live in harmony with all the peoples and in Leninist peaceful coexistence with all those states which are correct in their relations with it. It is for the defence of peace and against aggressive imperialist wars. Socialist Albania and the Party of Labour of Albania, which leads it, have their own policy and views on every question, and they express these views openly and publicly. No one will be in a position to drown down our just voice or to induce us to lower our revolutionary vigilance. Those who believe that smaller countries have no right to raise their voice are greatly mistaken. Nobody granted us the right to voice our ideas openly, always and everywhere, we won this right through bloodshed and great sacrifices. Our rights are sacred and we'll defend them with all our might. We will allow no one, whoever he be, to violate our rights, to defend unjust actions, when they are covered by international treaties concluded by others to the detriment of the interests of the Albanian people and outside their will, or to fail to meet legitimate obligations towards socialist Albania. The internal situation of our country is healthy in all directions, political, ideological, economic and military. Our People's Army, with the weapons it possesses in all its structures, is a force capable of defending Albania successfully against any enemy. Our people are united in a steel-like unity round the Party and its line, and our economy is stable. At a time when the whole capitalist-revisionist world is in a crisis, our economy is developing at steady high rates, the standard of living of our people is good and constantly improving, the defence potential of the Homeland is powerful and invincible. Our socialist industry is advancing at high rates, too, passing over from one stage to the other. From a smallscale industry we have passed today over to the construction of plants and factories with our own forces. Of course, in the future, too, we shall import machinery for factories which we are not yet in a position to make ourselves, however, even today we have all the means required to advance in this field, too; we have the metallurgical combine in Elbasan. It is a huge, colossal combine, which in the future will be enlarged with other factories, and we shall cut down on the import lists of many goods, while increasing our exports at the same time. With us everything is harmonized with our current and perspective needs, with our possibilities. In our development there is no spontaneity, there are no useless and chaotic investments, no pointless and uncontrollable spending. and judge for themselves where we have been and where we are, and they can see our daily advance. We have done and are doing everything with our own sweat and our own blood which we have been shedding since the time of the war. Your comrades have fallen in building railways, in the mines, on construction sites, but their blood has become a major mobilizing force. The people understand the situation and have unshakeable confidence in the Party and in their own future. The political consciousness of our people has risen and is steadily rising, our ideology has created and raised our new man with a clear idea of his rights and duties, who understands the proletarian discipline at work and the good conduct in life and who, before thinking about his personal interest, thinks about the common interest. These are the invaluable characteristics and merits of our social system of the dictatorship of the proletariat, one of the most democratic, the most advanced, and most humane systems, resting on proletarian justice, the protection of personal freedoms and the defence of the general freedom of the Homeland. National oppression, prohibition of the free expression of creative ideas, genocide and apartheid are unknown in our country. Our people are neither rich nor poor, they hate luxury and corruption, their life is characterized by dignity, love of work, and affection and respect for one another. Our social system is a creative one. This is a great merit of our working class which, in alliance with the peasantry and under the leadership of the Party, guides the life of the country and has created all these material and spiritual blessings. Now we are drafting the 1984 plan, which will bring new victories to our people and Homeland. The achievements hitherto, the favourable conditions created by the Party must be utilized so that they serve to draft an optimal and mobilizing plan, which will make the Homeland more prosperous and stronger and the living of the people better. We must make more efforts to strengthen organization in production, planning, education, culture, science, etc., which in turn makes for bigger mobilization of the working people, increases their zeal and makes their work more fruitful. We must use to our best abilities the experience we have gained in management and organization, technique and technology, improve on this experience and adapt it to the situations which may arise. Our creative work requires this constantly, now and in the future. Likewise, saving must be on the order of the day. A thrifty people, making no wasteful spending, is a people capable of living through the centuries. The plans of the Party and the tasks of all and sundry, wherever they work, must be carried out to the letter and on time, with a lofty sense of duty and responsibility, both personal and collective. This guarantees our construction of socialism, our freedom, independence and sovereignty, and the prosperous future of our socialist Homeland. The enemies are constantly plotting against us, but we are prepared and have taken all the measures to cope with them. Albania is not an easy prey. This must be clear to them. True, Albania is a small country, with a small population, it does not possess such highly sophisticated weapons as our enemies have, but the enemies know, also, that the Albanians are a brave people and that they are all united round the Party, and the price for setting foot on Albania will be too high for them. Those who dare bring the fire to our soil must know that they will get burnt in it. Therefore, comrades, it is our duty to make our country, our Homeland strong and prosperous in all aspects, bearing always in mind that this is the deed of the Party and the Party will guide us on the road of progress. The Party is our guarantee, because it is the vanguard of the working class. The Party cannot exist without the working class. It is the great strength of the proletariat which makes its vanguard as strong as steel, which creates the unity between the working class and the peasantry, among the workers, the peasantry and the intelligentsia, and enables them to overcome still greater difficulties under the leadership of the Party. Even if storms rage against us, we will breast them. Therefore, we must put the shoulder to the wheel, comrades, being always vigilant, creative and bold. This is a question of major importance. We must have the courage to act, the courage of our opinions, the courage to criticize everybody who is not on the correct course of the Party. All this is for the good of the Homeland and for the strengthening of unity. Nobody must take offence at his comrades' criticism, on the contrary, must consider it a salutary lesson. Let us continue to work ever better, so as to show our people through deeds the correctness of the line of the Party of Labour of Albania ; let the good and progressive people throughout the world see and judge the reality of our socialist Albania. I am 75 years old now, but I will live longer. I will live longer because you give me strength, the work of the Party gives me strength, and you are that force of mind which helps us to co-ordinate our work and reach the right conclusions. You must not think we are Zeus' mind. You exist, therefore we exist. You have elected us and we must perform our duties to the letter, as long as we breathe. The closer the leadership to the people, the better it listens to the people, the closer are its links with them, with their problems, because we have and will continue to have problems and difficulties, the more invincible it becomes. That is why this unity, the Party-people unity, must be continuously steeled. I like to stay longer and talk with you. I am very pleased with your visit, not only because you came here for my birthday, but also because you informed me about your wonderful work. However, I am also pleased with your congratulations on my birthday. I wish I could always be near you in all your joys. A WOMAN COMRADE: And you are always with us, Comrade Enver. who are treated and healed in hospitals. I am happy about all these blessings which the Party has created and which will increase in the future. May success attend you in your work! May you always be merry and happy! Defend your country, under the leadership of the Party ! The Party will always be with you and will support you, because you are the great support of our Homeland and our nation. I once again thank you for your congratulations on my birthday and hail your victories, which rejoice me and give me fresh energies. Hence, forward comrade workers and cooperativists, young men and women, specialists in production, workers of culture, forward comrade communists, to new successes in accomplishing the current tasks and those which the Party will set us in the future! Best regards to all your workmates. I wish you happiness in life and in your families! Long live our Party ! May it become ever stronger! Let us raise a toast to the Party and to your health, dear comrades!